PLEASE SPECIFY IN COMMENT SECTION WHEN PURCHASING IF YOU WOULD LIKE THIS PRODUCT IN A CEILING PENDANT OR LAMP BASE FITTING. ALL SIZES ARE AVAILABLE ON REQUEST. PLEASE EMAIL ME FOR PRICES. 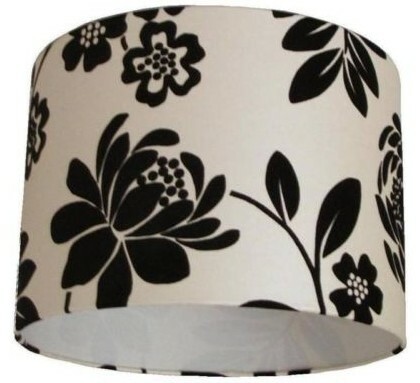 This lampshade is handmade to order using a genuine flock designer wallpaper. A floral trail, soft velvet feel flock in dark black on a pearlised cream background. The pattern continues right around the lampshade and top and bottom edges are hand rolled so that the pattern continues beyond the edge. All my shades are lined with a professional flame retardant white PVC. Suitable for both standard UK and EURO size light bulb fitting. A low energy bulb is recommended.